They say it’s better not to know how the sausage is made. The idea is that if you know how your favorite thing is put together it might put you off it forever. It’s true that when it comes to creative outputs things are much messier than the final polished product might suggest. Creatives are notoriously difficult to organize. Yet somehow every season we’re inundated with dozens of shows. How do they do it? Let’s have a look at the broad overall process of getting an anime in front of your eyeballs. Obviously, each studio takes its own unique approach to making their shows, but just about every anime has to go through the same general steps. Every anime has to start with a story idea. There are three main sources of story for anime: manga, light novels, and original scripts. Obviously, story ideas can come from anywhere, but popular manga and books in Japan make a lot of sense to use since they already have a fanbase. Ultimately, any story has to be converted to a script suitable for the anime medium; taking into account episodic length, story pacing, and other unique issues not faced by mangaka and novelists. The director, along with the writers, are key figures in getting the script into shape. Once the studio in question is happy with the script it will greenlight the project and pre-production will begin. “Pre-production” is the phase of the project before anyone has actually started making the show. All film and television projects have a pre-production phase; the length of this can vary widely, based on several factors such as how big the project is going to be, how much money is needed, and so on. Pre-production begins from where the pitch or idea for a new anime happens up to the point where the animation itself is ready to start production. All the project planning and financial preparation happens here. Licensing of story rights, hiring of the right people, and getting investment from various sources are jobs done by the producers of the show. They are the ones who need to line everything up so the actual show can be made. It is a daunting task. The director plays an important role in this. He or she will be part of pre-production because they have the say when it comes to hiring the rest of production crew. Just as in Hollywood, to fill key positions directors will hire people they trust and have worked with before. Directors are the creative head of the project; not the business head. So they have to work with the budgets and deadlines agreed upon with the producers. Different studios have different staffing situations as well. There might be a core of in-house staff augmented by contractors as projects come and go. Once the money, people, and facilities are agreed upon the actual production part can begin. In case you didn’t know, animation works by quickly flipping through drawings of different phases of motion in order to create the illusion of actual motion. Film works the same way, but each “frame” is a photograph rather than a drawing. I’m just mentioning it, because keeping the nature of animation in mind will allow the next phases to make more sense. The script describes the story in terms of scenes and dialogue, but it’s not a visual representation. The director needs to turn the script into a visual guide in order to communicate to the animators exactly what he wants. That’s where a “storyboard” comes in. This is a set of rough sketches that detail what is meant to happen in each scene. It also shows what scene layouts should look like and so on. 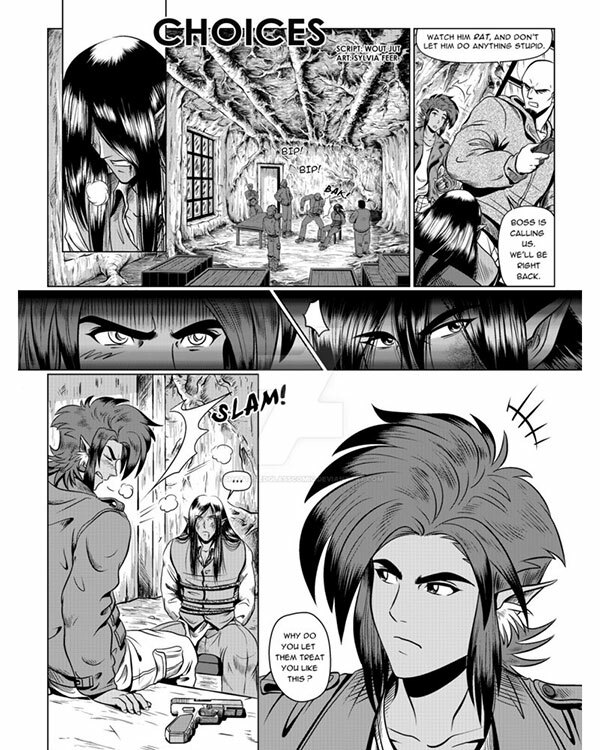 There may also be concept art if the story doesn’t already have visual design, as a manga would. Since this is animation, there’s no actual “camera” filming scenes. Instead, “layouts” are created from the storyboard that show what the background and perspective should look like, where cuts will happen, and how the “camera” will move. Layout design is where animation production really begins. 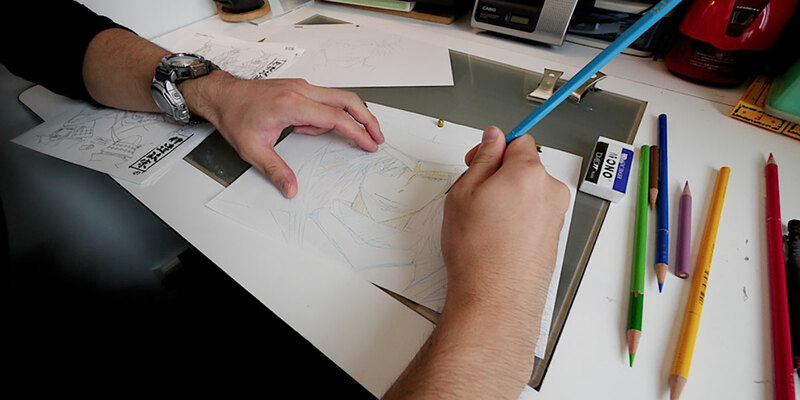 The layouts are given to the key animators. They will create the high-quality key frames. That is, the first and last frame of any smooth motion on screen, such as someone turning their head, pulling back for a punch, changing facial expression, and so on. 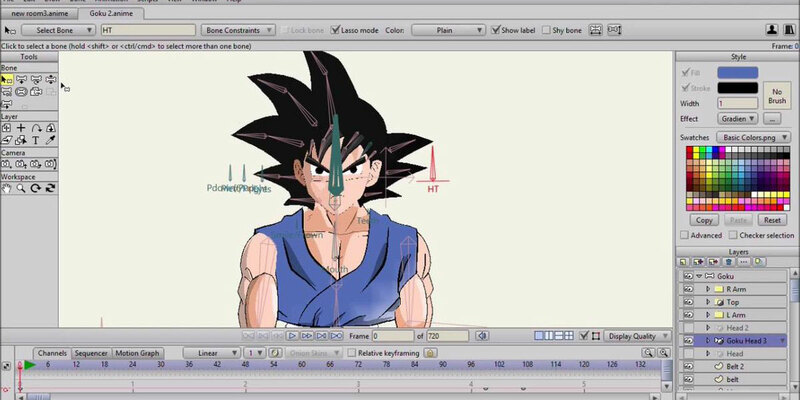 The key frames are therefore the backbone of the animation and serve as a reference throughout the animation process. In order to create the illusion of smooth motion, films present us with 24 frames a second or more. This would imply that you need 24 drawings for each second of animation! Since there are typically only two or three key frames per second of anime, those extra frames have to come from somewhere. The unenviable job of drawing all those frames goes to another type of animator called an “in-between” artist. As you’ve probably figured out, this person draws all the frames between the key frames. This is a less senior artist and the work is often outsourced to cheap labor in places like South Korea. While the key frame artists have to actually create the original animation design and objects, the in-between artist has those key frames as reference, which makes their job easier, in principle. It’s still grueling work that requires a lot of talent. In-between artists are often very poorly paid, as are most people in the anime industry, to be honest. Luckily they don’t have to draw every single frame for every second of footage. Drawing a separate cel for every single frame in a given second is referred to as “animating on ones” in the industry. That sort of fluid motion is only reserved for big budget productions or for specific scenes (such as fights) that justify the extra effort. Most of the time, a show will be animated on “twos” or even “threes”. In other words, only every second or third frame is is animated. It’s with in-between animation that most quality issues arrive, and so they are all quality controlled by a dedicated supervisor. Still, some shows such as Naruto, with its insane production schedule, let some truly weird in-betweens slip through every now and then – something fans will capture and post on the internet with glee. These days, regardless of how animation starts it inevitably ends up as digital media. Once the animation teams are done, everything needs to be colored. The colored cels are put against the backgrounds as per the layouts. In modern anime this is also where CG elements are added. Now everything must be filmed together as a composite to create the final video. Anime aren’t silent movies! This means there’s still quite a lot to do. The voice artists need to breathe life into the characters, so final or near final animation is sent to the dubbing studio where voice tracks can be created. We still also need things like ambient sound, sound effects, music, and any other audio work such as mixing and mastering to be done. After all this work, your episode is basically ready to ship out, and then you get to start the whole process all over again! I hope it’s clear that these are just the broad strokes of anime production. There’s a lot more fine detail that there simply isn’t space enough here to go through. This is also a sort of naive order and clinical description. In real life, anime projects can be chaotic and follow their own weird order and schedule. So don’t think of this as a recipe for making anime, but rather a list of main ingredients. Each studio will bake their anime in a different way. Things are also changing rapidly. There’s a move towards full CG animation, where 3D cel-shaded graphics are used for everything in the show. Sometimes this works very well, but many new CG anime shows (such as the Berserk reboot) look pretty awful. It’s a technology that studios are only slowly learning to use properly. When done right, such as in Knights of Sidonia, it can look great. However, there will always be a certain charm to hand-drawn 2D characters. Making anime is largely a thankless job. Japanese animators get paid very little and have to work brutal hours; yet they possess amazing artistic talent. This is not a career you get into to make a ton of money. It’s an art driven by passion, and knowing how this particular sausage is made helps us appreciate it even more.